I think Merle is broken in two ways. 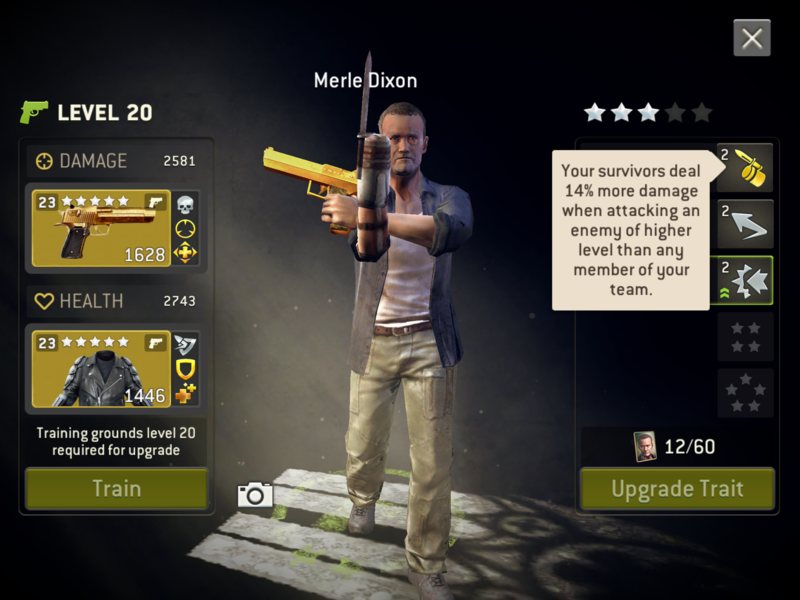 The announcement about Merle reads, "Merle is unlocked as a Rare survivor with 250 tokens. Unlock him and benefit from the Jackass leader trait: Your team deals 16% more damage when attacking an enemy of higher level than the highest member of your team. [Upgradeable to 30%]"
1. The way I interpreted this was Merle unlocks with jackass at 16% more damage. Is this incorrect? Is the 16% after jackass is upgraded? I'm asking because my Merle shows jackass as a 14% boost. 2. I do not think he's giving my damage either 14 or 16% boost. I am aware the sample size I'm basing this conclusion on is not large enough and as such ought to be taken with a grain of salt. I tested it in quick scavenge missions. I used the same hunter with the same weapon. All damage numbers were versus a level 22 walker, my team are all level 20, with no critical hits included in the numbers. The team for the numbers without jackass did not have a hero who impacts damage in the team. I was thinking @Teeceezy @Shteevie or @Fearofabotplanet might be able to provide some clarification. I was hopeful @DLich @Bill_ZRT or @Warlord could tell me if I'm on the right track at beginning to assess my damage results to see if the percent increase of damage approximates the advertised amount. I do not post often in the forum except to assist my guild in recruitment, though I do read posts and you seem to be several of the resident data driven analytical members. I tried my best to keep as many constants as possible in my data gathering, I know damage varies and so I need a larger sample, I wanted a quick assessment to start from. As math is not my forte I appreciate any advice you can provide, on my tracking project. Hey @Mere! We're currently not aware of any issues with Merle's leader trait, and we'll look into it. Thanks! @docfinzenburg Sounds reasonable to me. "Your survivors deal" -> that means probably only the base survivor damage and not any gear damage. I wonder if this then also applies to other Heros as well. Ab:: ".... their attacks deal..."
But if that's the truth...14 % (in anouncement 16%) of base survivor damage (without weapon damage) it's a totally useless leader trait i think! I hope thats not intended. Maybe a moderator can clear the situation. 2281-1186 would be the hunter's stats @docfinzenburg using that example. @docfinzenburg yes to marksman, it's level 4, 12% more damage. Thanks to all here to dig in the dark. That's exactly what I don't think it's an appropriate behaviour of a developer. I believe NG should tell us exactly how mechanism works instead of letting the player try to find it out by try and error.